Monday, June 26 marked the 20th Anniversary of the Americans with Disabilities Act (ADA), the civil rights legislation that prevents discrimination based on disability. The legislation helped make sweeping changes for disabled individuals in the areas of employment, built environment, public transit and other areas. But for Pat Hall, Metro’s Director of ADA Services, the legislation has very personal implications. Physically disabled since birth, Hall grew up navigating the world built for individuals without disabilities. During a time when separate schools for children with disabilities were common, Hall attended Normandy High School in St. Louis and even participated in gym class. After earning two masters, in Rehabilitation Counseling and Rehabilitation Administration, she now heads Metro’s ADA Services Department. 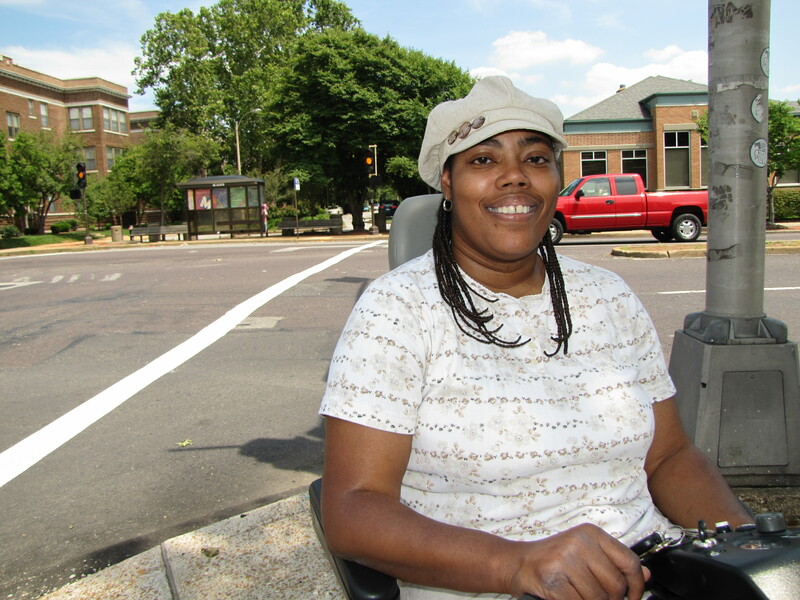 The department is responsible for ADA paratransit certification for Metro and our travel training program for people with disabilities, as well as fostering community partnerships and conducting sensitivity training. Hall feels that the country has come a long way in providing equal access for people with disabilities, but still must work for attitude changes. Hall looks back fondly over what she called her “radical advocacy days” before and immediately after the passage of the ADA legislation. In 1994, she and a group of activists chained their wheelchairs together at the St. Louis Greyhound station to protest that the Greyhound buses were not wheelchair accessible. “The police had brought down a Call-A-Ride van to use as a paddywagon. Can you believe it? We were down there protesting that the buses were not accessible, and the police bring in special accessible vans to arrest us!” She said the protesters were able to hold up the Greyhound buses for several hours. (Greyhound finally unveiled plans to make buses and stations accessible in 1998 after years of pressure). Accessibility advocates like Hall helped raise the public awareness of the needs of people with disabilities, paving the way for political support for the ADA and continuing progress. Disability advocates climbing up steps of the Capital Building to raise awareness for rights of the disabled. Photo at the Missouri History Museum ADA Exhibit, pic taken with permission. 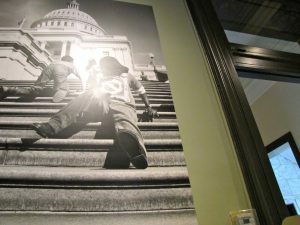 If you would like to know more about the Americans with Disabilities Act of 1990, and the rights, opportunities, technology and life of disabled individuals throughout history, please visit the great exhibit at the Missouri History Museum: The Americans with Disabilities Act: 20 Years Later. And, Hall can often be seen riding the Metro system. If you see her, I highly recommend stopping to talk to her. We love our Pat Hall. This article on where people talk to those with disabilities is how people should be as long as they are talking friendly. I know exactly what she means about Greyhound mistreating people with disabilities. Greyhound even rebels about equipping their buses with wheelchair lifts by getting snotty about selling advance tickets. They don’t tell you how far in advance you can purchace the discounted tickets. They know fair and square that they have no authority to discriminate against handicapped travelers in any way. And now, look at what has happened to Greyhound. They lost a lot of customers.